For the second year in a row, I am involved in a cookie swap hosted by Veronica's Cornucopia. I mail 3 dozen cookies to three people and they each mail me a dozen cookies. The kids can't wait until the cookies start arriving! 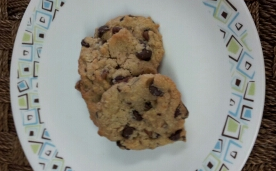 This year I wanted to get my cookies out early so as soon as I received my assignment for The Secret Recipe Club, I went straight to the cookie section in Taryn's blog. Her blog, Sweetly Serendipity has an awesome variety of recipes and I was pleased to see that I had many cookie recipes to choose from. 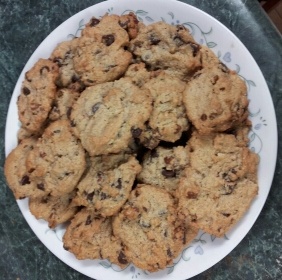 I chose the Chocolate Chip Walnut Cookies because one of my recipe swappers eats gluten free. This was a bonus for me as I eat gluten free too and love trying new recipes. I only ate one but they were really, really good. I loved that there was maple syrup in here instead of sugar. Everyone who ate these loved them. Even the ones who claim they can "tell" when a cookie is gluten free, were blissfully unaware that they were gluten free. My kids were sad that they didn't get to eat too many as I had to package them up for shipping. In a large bowl, combine almond flour, salt and baking soda. Set aside. In a small saucepan melt butter, then add maple syrup and vanilla, and mix to combine. Make a well in the middle of the dry ingredients, and pour wet ingredients into the dry. Mix to combine. Fold in walnuts and chocolate chips. Mixture will be thinner than normal cookies but they will be fine. Scoop dough onto prepared baking sheet, about 3 inches apart. Bake at 350° for about 12-14 minutes, or until golden brown and set.